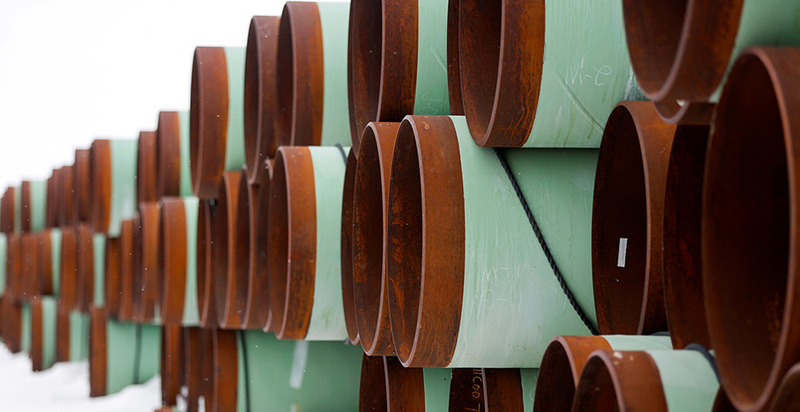 The Trump administration is considering executive actions to boost the proliferation of pipelines across the United States and limit state interference on water permitting, according to multiple industry sources familiar with the discussions. The expected actions have been delayed by the partial government shutdown now surpassing a month, sources said, and would potentially touch on everything from boosting pipeline approvals out of areas like the Permian Basin to potential action on liquefied natural gas exports. Another focus: reforming states' ability to block permits under Section 401 of the Clean Water Act. Details for now remain sparse, and sources cautioned that the actions are far from settled. Leading the effort is Francis Brooke, a senior energy adviser to President Trump who left Vice President Mike Pence's office to replace former White House energy aide Mike Catanzaro. The White House said it would not be providing comment on the expected orders. Politico, which first reported on the executive actions, cited a senior administration official who said the push was aimed at showcasing the United States' energy strength before Russia. An attorney and lobbyist who has represented energy companies in Washington for over two decades said there had been reports about the administration using executive action to address energy infrastructure issues. The attorney said action from the administration would be welcome and noted the challenge of meeting the administration's goal of "energy dominance" without taking more direct action on improving energy infrastructure. Lack of adequate and predictable infrastructure is also hampering U.S. companies' expansion into foreign markets, said the attorney. "Hopefully, an executive order can set that appropriate tone on pipelines, transmission, LNG and related topics. Of course, agencies must implement any changes in priorities. And in some cases, Congress must act as well. But executive action can concentrate attention," the attorney said. Another industry source with direct knowledge of the executive action said such an order could touch broadly on energy issues, even though it is billed as being focused on energy infrastructure. "The Trump administration has taken great strides to grow America's energy renaissance into an asset in ways it never has been, but there's lots of work left to be done. Industry is looking for President Trump to build on his past actions to make permitting more predictable, transparent and, frankly, sane," the source said. "This is a golden opportunity to maximize the potential of all the energy resources and technology America has developed to help us at home and abroad." An executive action could help the Trump administration appease both energy producers pushing back on Trump's steel tariffs and Republicans who for months have been looking at potential legislation and administrative changes to stop states from using their authority under the Clean Water Act to halt or slow natural gas pipelines. But it would also run into stiff opposition from environmental groups and Democratic governors like New York's Andrew Cuomo, who have used state authority under the Clean Water Act to block controversial gas projects. Sources expect any executive action to broadly apply to infrastructure permitting, with a focus on easing transport of fossil fuels from the wellhead to market, either domestically or internationally. Doing so could include facilitating construction of pipelines across international borders, as well as LNG exports. The industry source with direct knowledge of the executive action noted that its broader focus was to leverage "energy dominance" both geopolitically and to enhance the U.S. economy. The administration is looking at a variety of ways to eliminate or ease obstacles to those objectives. "It's important for people to appreciate how ever-present infrastructure is throughout the entire energy economy, which is to say actions focused on infrastructure is much more than pipelines and export facilities," the source said. The executive action is meant as a tool to focus attention and prioritize energy-related issues within the Trump administration. "It can facilitate a process, but it cannot add authority inconsistent with underlying statutes," the attorney said. The order would build on previous efforts early on in the Trump administration to promote infrastructure improvements. Among those is Executive Order 13807, which was aimed at increasing accountability in environmental review and the permitting process for infrastructure projects. That executive order established the "One Federal Decision" process, in which one agency is responsible for making sure a project moves through interagency review and sets a unified timeline across those agencies. Ross Eisenberg, vice president of energy and resources policy at the National Association of Manufacturers, noted that the Trump administration had previously put out a comprehensive list of improvements to environmental review under the National Environmental Policy Act and on permitting changes. "There's a lot of good ideas in that. To the extent they operationalize that, that would be fantastic," Eisenberg said. Among the items NAM would like to see change is to enable federal agencies to run concurrent environmental reviews of a project, instead of requiring each agency to conduct reviews one after the other, with no specific deadline of when the reviews had to be completed. "A simple fix is to require them to work all at the same time. We would like to see that become mandatory," he said. An administration official had signaled last year the president would focus on energy infrastructure in 2019. Larry Kudlow, director of the National Economic Council, told attendees of an October event at the Economic Club of Washington, D.C., that the administration would be continuing to make progress on its infrastructure agenda. He noted the need for more pipelines for natural gas. "We need infrastructure, including pipelines. We need east to west, we need west to east," he said, according to reporting by The Hill. Energy companies have pushed the administration for help reforming states' authorities under the Clean Water Act since New York and Washington refused to permit two high-profile projects in 2016 and 2017, respectively. The law's Section 401 clearly grants states the right to "certify" that projects requiring Clean Water Act permits comply with both the act and their own water quality standards. That means projects being permitted federally by EPA, the Army Corps of Engineers or the Federal Energy Regulatory Commission also must be approved, denied or approved with conditions by states. EPA water chief David Ross told the Environmental Council of States' annual meeting this fall that the agency is considering changing policies for how much time states have to make their certification decisions — a move that many state groups including the Western Governors' Association, Association of State Wetland Managers and Association of Clean Water Administrators have already expressed concerns about. Sources at the meeting said Ross didn't comment on whether the policy change would come via an executive order, agency guidance or formal rulemaking, but Senate Environment and Public Works Chairman John Barrasso (R-Wyo.) has requested the agency update Obama-era guidance on 401 certifications. Under the Clean Water Act, if states don't make their certification decisions "within a reasonable time" set by federal agencies, they waive their authority and a project can proceed without state action. The law itself is vague about when that clock starts, and EPA has previously interpreted it to mean the countdown begins once a state decides a permit application is complete. Critics have argued that schedule allows states to run out the clock to get more time for review, telling project developers at the last minute their applications are incomplete and states will have to deny the application if they don't get more information, which would restart the clock. Both New York and Washington state engaged in similar requests before denying permits for the Constitution pipeline and a terminal from Millennium Bulk Terminals, respectively. The administration could place a limit on what is considered a "reasonable time" for state decisions, and determine that the clock starts ticking when applications are filed. State groups have already pushed back in a letter to Ross against "any changes to agency rules, guidance and/or policy that may diminish, impair or subordinate states' well-established sovereign and statutory authorities to protect water quality within their boundaries." Experts have also warned that, faced with tight timelines, overtaxed state regulators might be forced to deny permits they would otherwise approve if they had more time or information to consider them. "It could be a classic case of be careful what you wish for," said Cynthia Taub, a partner at Steptoe & Johnson LLP who leads the firm's National Environmental Policy Act practice. Talks of potential executive action arrive after a legislative fix from Senate Republicans failed to make it to the floor last Congress. The bill, sponsored by Barrasso, would have required states' certification decisions to be based only on water quality concerns from the project in question, not other sources, and require states to publish clear requirements for water quality certification requests (E&E Daily, Aug. 1, 2018). The bill is unlikely to be taken up again with a Democratic-controlled House.